Day 174 – Remember Hi Fidelity! So, taking a walk on memory lane, we were looking at our vinyl albums recently wondering if we’d ever play them again? Some of our favorite artists’ albums were in the stack – – Jean has a John Denver album . . . Brian has a Moody Blues album – but without a turntable, they just sit around collecting dust. We’ve been to a couple of Half Price Books – here in San Marcos and in Austin – and the number of albums for sale is growing. It’s a throw back to when they were at their peak in entertainment. Each of our families had their own version of record players as we were growing up. In fact, the one that Brian’s parents had in their living room back in the mid-1960’s is still at our house today. Does it work? Don’t know – haven’t tried . . . not sure that we’d want to do that! But, what makes it cool to at least look at is the fact that it was stereo, BUT. . .it was stereo hi-fi–otherwise known as high fidelity. A little history from our friends at Wiki, please. . .“High fidelity—or hi-fi or hifi —reproduction is a term used by home stereo listeners and home audio enthusiasts (audiophiles) to refer to high-quality reproduction of sound to distinguish it from the poorer quality sound produced by inexpensive audio equipment, or the inferior quality of sound reproduction characteristic of recordings made until the late 1940s. Ideally, high-fidelity equipment has minimal amounts of noise and distortion and an accurate frequency response.” All we know is that when we put our albums on the ‘hi-fi’, they just sounded better. It goes on to say, “In the late 1950s and early 1960s, the development of the Westrex single-groove stereophonic record cutterhead led to the next wave of home-audio improvement, and in common parlance, stereo displaced hi-fi. Records were now played on a stereo. In the world of the audiophile, however, high fidelity continued and continues to refer to the goal of highly accurate sound reproduction and to the technological resources available for approaching that goal. This period is most widely regarded as “The Golden Age of Hi-Fi”, when tube equipment manufacturers of the time produced many models considered endearing by modern audiophiles, and just before solid state equipment was introduced to the market, subsequently replacing tube equipment as mainstream.” Today, well everything is digital–somewhat impersonal–and quickly outdated. Perhaps–just perhaps–the reason that albums and turntables are making a comeback is because lost in the technology–has been the hi-fi! It’s appropriate that we talk about hi-fi tonight, and on top of that, we revisit a wine maker that we enjoyed previously. It’s kind of cool to try different varieties from the same wine maker and see if their touch is still working. 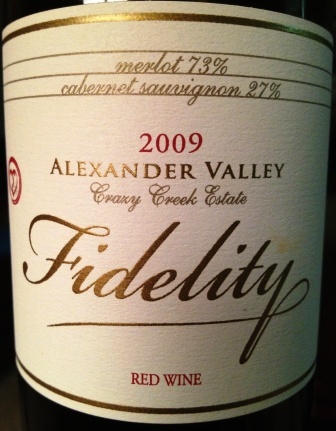 Tonight we sampled a 2009 Fidelity from Goldschmidt Vineyards. Having previously enjoyed (and blogged) about their Katherine Goldschmidt Cabernet Sauvignon, tonight’s wine is a blend of 73% Merlot and 27% Cabernet Sauvignon. We already knew what good wines were made by Goldschmidt, but were blown away by this blend. At less than $15 a bottle, it’s an amazing value for the money. Thanks to our friends at Twin Liquors, they’re smart to be bringing such variety and choice to their stores and Fidelity rates right up there. The nose was rich, dark fruited and hints of spice; the taste was well-rounded, supple, fruity and smoky . . . the finish was quick but full of flavor. In short, for a wine priced at this level, we felt like we were tasting a wine that was much older and more moderately priced. You may want to stock up on this 2009 while you can, but the good news is that the 2010 is just as good if not better . . . the blending is a little different but the result is quality through and through. Just like listening to hi-fi, you know quality when you hear it; tonight’s 2009 Fidelity from Goldschmidt Vineyards was quality to the taste. As the week winds down and we’re at the front door step of another weekend, we hope that you’ll continue to enjoy your favorite wine responsibly and remember to recycle whenever possible. Categories: Uncategorized | Tags: Alexander Valley, Crazy Creek Estate, Goldschmidt Vineyards, half price books, hi fi, Nick Goldschmidt, record albums, stereo, Twin Liquors | Permalink.